Ha! Someone’s logic needs tuning… Not having online friends can be a good thing! – real friends are much better – even if they aren’t in the 1000’s. 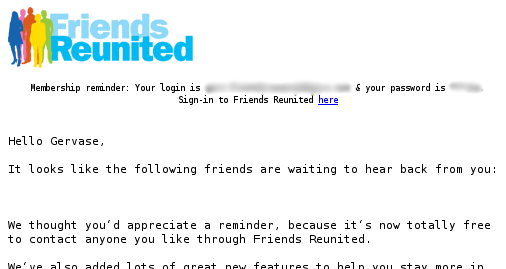 I wonder which is worse: that they go out of their way to point out you have no friends, or that they store your password in clear text. Ah, none of your friends have demonstrated that they are gullible enough to sign up for the pointless service being advertised. Consider yourself fortunate to have such sensible friends.